96 / the tasting panel / march 2015 TASTINGS "A ustralia has no unique selling proposition—there's a lot of diversity, historical winemaking styles, but also innovation, and some of the oldest vines in the world, since the nation was mostly phylloxera-free," said Mark Davidson, Wine Australia's Global Education Manager. "But if asked to describe Australian wine in one word—and I hate these questions—I'd say fresh, across the board." Davidson's seminar at Australia Today 2015 explored the country's 200-year- old winemaking history and changes in recent years with panelists Tim Gaiser, a Master Sommelier and ex-Director of Education for the Court of Master Sommerliers, Americas; retailer Ryan Woodhouse of K&L Wine Merchants in San Francisco; and Allister Ashmead, co-Managing Director of South Australia's Elderton Wines. Showcasing four wines from cool-climate regions in a San Francisco tasting designed to explore the country's diversity, Gaiser noted, "These are reality-check wines—con- sumers and the press all think of the place as a subtropical climate, with Barossa Valley Shiraz," a refer- ence to Australia's signature grape and iconic South Australia wine region. The wines: Vasse Felix 2013 Chardonnay, from Margaret River, Western Australia, cooled by three oceans; Grosset 2013 Alea Riesling from Clare Valley, South Australia, known for bone-dry Rieslings, though this one has a bit of residual sugar; Cullen Wines 2012 Diana Madeline, a Cabernet Sauvignon/Merlot/Cabernet Franc blend from Margaret River; and Jamsheed 2011 Garden Gully Syrah from Great Western, Victoria. Pourings by Australia's oldest family-owned winery, Yalumba, a Barossa Valley winery founded in 1849, included The Signature 2010, a premium Cabernet Sauvignon/ Shiraz (the blend is "Australia's true great gift to the world," according to Ashmead), its Eden Valley Viognier ("I don't think anyone does Viognier better," said Gaiser of this pioneer of the Rhône grape in this region) and, from Yalumba's sister winery, the Jansz Premium Rosé from Tasmania, a cool- climate island. This sparkling blend of Chardonnay/Pinot Noir/Pinot Meunier is from Jansz, Australia's most highly- regarded sparkling wine producer, whose original owners partnered with Louis Roederer Champagne in 1986 to make sparkling wine. Yalumba's owners purchased it in 1997. Sixteen brands seeking U.S. repre- sentation were showcased, including 3 Oceans Winery in Margaret River; The Islander Estate Vineyards on Kangaroo Island, South Australia, founded by a Bordeaux winemaker; and Sirromet Wines in the Granite Belt of Queensland, one of Australia's highest- elevation vineyards. All are winners of medals and high ratings. For more information, go to www.wineaustralia.com. 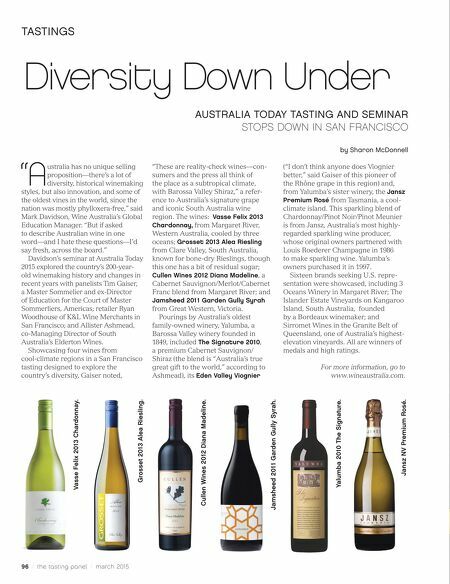 Diversity Down Under AUSTRALIA TODAY TASTING AND SEMINAR STOPS DOWN IN SAN FRANCISCO by Sharon McDonnell Vasse Felix 2013 Chardonnay. Grosset 2013 Alea Riesling. Cullen Wines 2012 Diana Madeline. Jamsheed 2011 Garden Gully Syrah. Yalumba 2010 The Signature. Jansz NV Premium Rosé.